A particularly classy crop of two-mile novice chasers comprise the 47 entries for the 2010 Irish Independent Arkle Challenge Trophy Chase at The Festival on Tuesday, March 16. Sizing Europe was top-class over hurdles, winning the 2008 Irish Champion Hurdle. The Henry de Bromhead-trained eight-year-old maintained his unbeaten streak over fences at Leopardstown on December 26, when winning the Grade One Bord Na Mona Nature Novice Chase by five and a half lengths from Osana, trained by Edward O’Grady, who landed the prize in 1996 with Ventana Canyon. 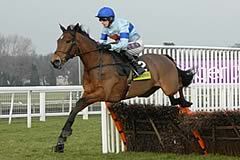 The outcome may have been different however, had the strong-travelling Edward Harty-trained Captain Cee Bee, winner of the Grade One Spinal Research Supreme Novices’ Hurdle at the 2008 Festival, not fallen at the last fence. De Bromhead could be doubly represented as the trainer’s An Cathaoir Mor, having defeated the Noel Meade-trained Nicanor in a beginners’ chase a week earlier, landed the Grade One Frank Ward Solicitor Arkle Novice Chase at Leopardstown on January 24. The Willie Mullins-trained Sports Line was runner-up that day and the Irish champion trainer is responsible for eight of the formidable 16-strong Irish contingent. The octet also includes last season’s impressive Grade One Neptune Investment Management Novices’ Hurdle winner Mikael D’Haguenet, 2008 Grade One Weatherbys Champion Bumper hero Cousin Vinny, Uimhiraceathair, Quiscover Fontaine and Citizen Vic. Jessica Harrington saddled the great Moscow Flyer to win the 2002 renewal and she has entered Grade Two MCR Novice Chase victor Roberto Goldback. The home defence will, as ever, be difficult to crack. Somersby, third to Go Native in last season’s Spinal Research Supreme Novices’ Hurdle for trainer Henrietta Knight, brushed aside Crack Away Jack to win the Grade Two Henry VIII Novices’ Chase at Sandown in December. 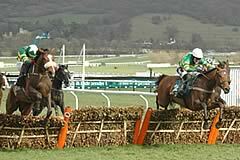 Champion trainer Paul Nicholls was successful in 1999 with Flagship Uberalles and in 2003 with Azertyuiop. He has five entries, headed by Tataniano, successful from the Nigel Twiston-Davies-trained Pigeon Island over the course and distance in the Grade Two Independent Newspaper Novices’ Chase on November 15. The Nightingale was the easy winner of a Fontwell beginners’ chase, while Woolcombe Folly was a classy novice hurdler. Nicky Henderson triumphed in the race with the brilliant Remittance Man in 1991, Travado two years later as well as Tiutchev in 2000, and has a particularly exciting sextet. Prolific French import Long Run already has three Grade Ones to his name, including Kempton’s Feltham Novices’ Chase over three miles on Boxing Day. French Opera has won his last two starts at Cheltenham, Mad Max scored over fences at the first attempt at Kempton on January 16, Riverside Theatre defeated the Lucy Wadham-trained El Dancer to win a Grade Two at the same course in December, You’re The Top is on a hat-trick and Dave’s Dream has always been held in some regard. The Gary Moore-trained Bergo slammed Franchoek at Huntingdon last time to go two from two over fences, while the strapping Quwetwo, trained by Howard Johnson who saddled Tidal Bay for victory in 2008, was smart over hurdles and is yet to make his chase debut. Ferdy Murphy trains Bedlam Boy, who is unbeaten in two chase starts, as well as I’m Delilah and Riguez Dancer, while David Pipe has entered Leo’s Lucky Star and Emma Lavelle has engaged Cheltenham winner Kangaroo Court. Class 1, Grade One, Total Prize Fund £150,000, 2.05pm, Cheltenham, Tuesday, March 16, 2010, two miles. For novice 5-y-o & upwards, two miles. Weights: 11st 7lb. Allowances: mares 7lb. Entries closed January 26, entries revealed January 28 (47 entries), scratchings deadline February 23, six-day confirmation stage March 10, final declaration stage 10.00am, March 15. Form figures supplied by Weatherbys and are correct up to and including the racing of Tuesday, January 26, 2010. May not include some overseas form. 1. The Arkle Challenge Trophy was inaugurated in 1969, after Arkle’s three wins in the Cheltenham Gold Cup (1964-66). In its first year, the race was worth £1,365, and was won by Chatham (10/1), trained by Fred Rimell and ridden by Terry Biddlecombe. The 2010 running has total prize money of £150,000. It was known as the Cotswold Chase before 1969. 1978 Alverton (Tote Cheltenham Gold Cup winner 1979). Alverton is the only horse to have won both The Irish Independent Arkle Chase and totesport Cheltenham Gold Cup. 4. The lowest number of runners has been eight (1979, 1984 & 1993) and the highest 19 (1987 & 2005) as the Arkle Chase - there were 25 runners in the Cotswold Chase in 1960. The current safety limit is 20. 5. The Irish Independent Arkle Chase has seen several trainers and jockeys run up strings of wins. Martin Pipe notched up successive wins with Or Royal in 1997 and Champleve in 1998 before Well Chief in 2004 and Contraband a year later gave him another brace of victories. Peter Easterby trained three winners - Alverton 1978, Clayside 1981 and Ryeman 1983. Among current trainers, Nicky Henderson leads the way with three successes (Remittance Man 1991, Travado 1993 and Tiutchev 2000), while both Paul Nicholls (Flagship Uberalles in 1999 and Azertyuiop in 2003) and Alan King, successful with My Way De Solzen in 2007 and Voy Por Ustedes in 2006, boast a pair of victories. Among jockeys, Jamie Osborne won three times, via a hat-trick between 1992 and 1994 on Young Pokey, Travado, and Nakir for three different trainers, Oliver Sherwood, Nicky Henderson and Simon Christian. Tony McCoy equalled Osborne’s three wins in 2004 when scoring on Well Chief, having also been aboard Or Royal (1997) and Champleve (1998). 6. Irish trainers have won The Irish Independent Arkle Chase 10 times, including four of the last 14 runnings with Klairon Davis (1995), Ventana Canyon (1996), Moscow Flyer (2002) and Forpadydeplasterer (2009). 7. The longest-priced winner is Gala’s Image, successful at 25/1 in 1987, while Pendil (1972) and Chinrullah (1979) are the shortest-priced scorers at 10/11. Six other favourites have won - Canasta Lad (1974), Clayside (1981), Bobsline (1984), Remittance Man (1991), Klairon Davis (1995) and Azertyuiop (2003).